Another one of the starship tulips. This time I left some of the BG clutter in, to my eyes it adds to the feeling of movement. After a little PP to brighten up the edges, I added a layer of SEP2 Film Noir preset blended on Darken. When I resized to upload, the edges got a little too bright. oh, well! It was while editing this one that I realized something about the way I shoot. I don't hold the camera up to my eye, but at arm's length. 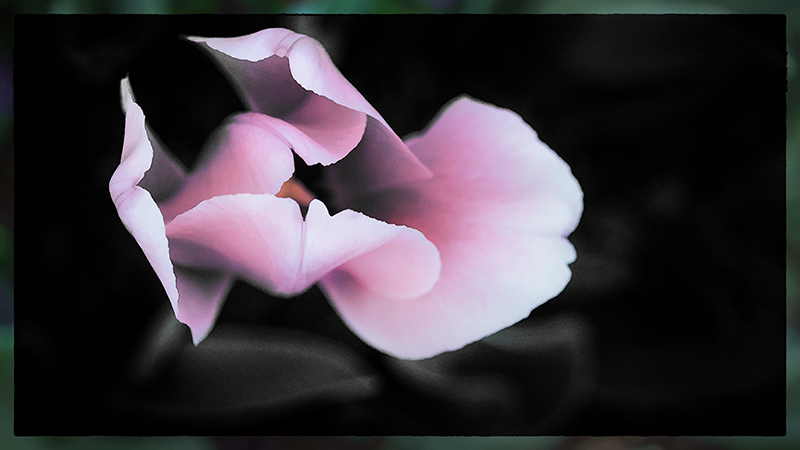 I aim it by looking at it, to line up the focal plane of the camera with the parts of the flower I want to be in focus. With the camera in my hand, I can make small adjustments to camera-angle. checking the screen to make sure it's still in the frame. When using a macro lens this is important to me. It's funny, how I can be doing something without thinking about it, & then suddenly figure out logically what I've been doing. I saw Mumford on Austin City Limits a couple of weeks ago. I also saw them interviewed and now I like them even more. This bloom has a sense of reaching, yearning. Very nicely processed, it looks great. I'll have to try your method of photography and see how it works for me - probably not as well for me as for you, because that is a technique you have adopted intuitively, while I would have to actively practice it. Really nice, I like the way you processed this with the black b.ground. Gorgeous colour. Interesting shooting technique. Oh, yes! It's truly stunning! Proudly hosted by Sargasso Networks. Current Server Time: 04/20/2019 02:19:38 AM EDT.